This paper details the unique pairing of Indigenous and maritime archaeological approaches in the ‘(Re)locating Narrunga Project’. Narrunga was a ketch built by the Narungga Aboriginal community at Point Pearce Mission (Yorke Peninsula, South Australia) at the turn of the twentieth century and later sunk in the 1940s. 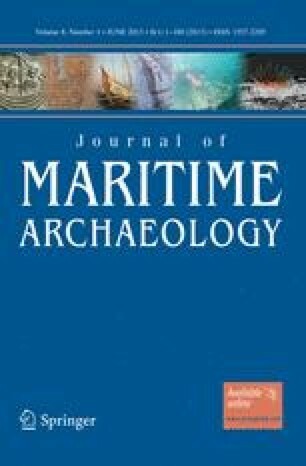 It is argued that convergences between the scholarly interests of Indigenous and maritime archaeological approaches have been slow to develop and that maritime archaeology as a sub-discipline has not capitalized on the insights that can be gained from collaborative approaches between communities and practitioners. Similarly, Indigenous communities in Australia have had few opportunities to work with researchers to record their maritime heritage. As is evident in the Narrunga story told in this research, non-Indigenous records have been complicit in underplaying the maritime achievements and skills of Narungga people and collaborative research can work towards decolonizing this past. First we would like to acknowledge those Narungga community members who participated in this project including: Cyril Kartinyeri, David Wilson, Doug Milera, George Walker, Lyle Sansbury, Haydn Sansbury, Quenten Agius, Carlo Sansbury, Edward Newchurch, Lance Newchurch, Ron Newchurch, Clayton Smith, Eddy Smith, Fred Graham, Eileen Wanganeen, Lindsay Sansbury and Barry Power. Special mention also goes to Flinders University for providing the funds for this project through Amy Roberts’ Re-entry Fellowship. Thank you to the archaeological field work volunteers: Jason Raupp, John Naumann and Kurt Bennett. Thanks too to Jeremy Green of the Western Australian Maritime Museum for his generous assistance with the magnetometer survey. Our appreciation also goes to the staff at the South Australian Museum archives for their assistance with this project. Thanks also to Tom Gara for providing us with copies of relevant newspaper articles. We also acknowledge Stuart Moody for sharing his knowledge about Port Victoria shipwrecks and Ben Simms for sharing his family’s recollections. Thanks too to the three reviewers of this paper—your comments have undoubtedly improved the content. This study was approved by Flinders University’s Social and Behavioural Research Ethics Committee (Project Number: 5336).